I think Tarantino gets a bit too much credit for his new movie. First of all the movie is awfully long. Generally speaking most movies work best if they are kept at around 1h30. That way you cut down to the bone. Tarantino however likes to drag certain scenes forever and ever. It is a black and white movie in the sense that all the black people are good and all the white people are bad. Well apart from the German bounty hunter Dr. Schultz (played brilliantly by Christoph Waltz), although it can certainly be argued if a bounty hunter who kills for money is really a good guy. 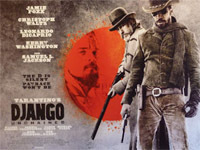 Jamie Foxx is the slave Django, who earns his freedom by helping Dr. Schultz track down some prey. Django is then in return trained as a bounty hunter. They then decide to go and free Django's wife who is now the property of Leonardo DiCaprio at the plantation Candyland. I think Leonardo acts rather unconvincingly as the plantation owner, but luckily for him Samuel L. Jackson steals most of the scenes as the only evil black man in the movie, Stephen. Jamie Foxx is okay as the bounty hunter, but the transformation from slave to bounty hunter is completely unbelievable. In fact he acts and sounds more like one of the boys from the hood. His wife Broomhilda [Kerry Washington] is mostly just a doll and also way too pretty for her role. It is however not a bad movie, I just don't think this is one of Tarantino's best. 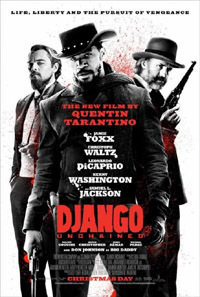 Tarantino knows his tricks and there is plenty of witty dialogue and explicit violence, be it from the white scum towards the niggers or be it from lots of unbelievable but very entertaining gun duels with lots of blood and explosions. It was not a bad ride, but it was certainly a very long ride.